Interesting. NBA playoffs were up considerably overall, Finals down with it being an uncompetitive sweep. However, down to a greater extent in the younger demos for a league that has the youngest overall audience. It appears the Cavs / Warriors fatigue set in disproportionately for younger viewers. NFL punishment is all over the place. No consistency whatsoever IMO. Yeah I have read about the NFL's drug testing policy or lack of. Surprisingly the MMA's testing program is touted as the best there is and Nascar's is said to be modeled after it. gnomesayin and LewTheShoe like this. MLB television ratings have been good — not great — so far this season, but network executives believe the league is shaping up for a huge second half. That’s because big-name teams from the biggest markets are positioned for playoff runs this season, and when big markets are engaged, TV ratings tend to soar. Nine of the 10 largest TV markets are home to teams that are over .500 and expected to play meaningful baseball in September (New York, Los Angeles, Chicago, Philadelphia, San Francisco, Washington, Houston, Boston and Atlanta). “It feels like you have the right brands and the right big markets where you want them to be going into the second half,” said Mike Mulvihill, Fox Sports executive vice president of research, league operations and strategy. Mulvihill credited Fox’s big events — the U.S. Open and World Cup — for drawing audiences to baseball games on Fox and FS1 in the first half of the season. Fox’s prime-time windows are averaging 2.544 million viewers, up 11 percent and a five-year high for the Fox broadcast package. MLB games on FS1 are averaging 420,000 viewers, down 13 percent from last year. With a U.S. Open lead-in, the St. Louis Cardinals-Chicago Cubs game on June 16 averaged 3.1 million viewers. 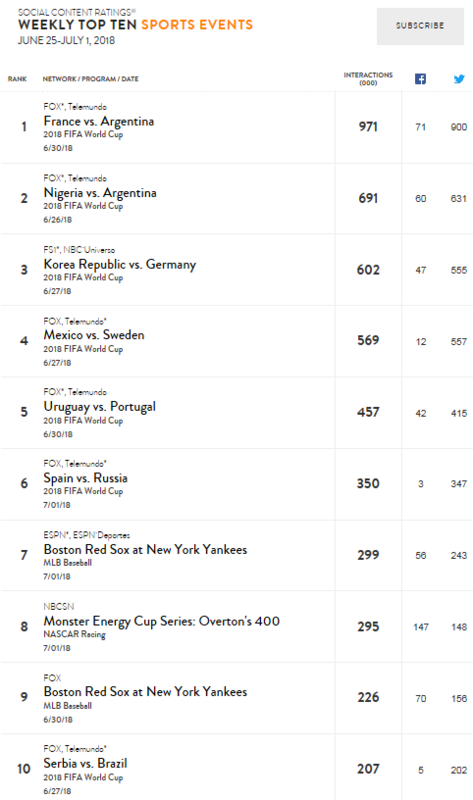 With a World Cup match earlier in the day, the Boston Red Sox-New York Yankees game averaged 3.2 million on June 30. Those are Fox’s two biggest regular-season MLB audiences since 2013. FS1 scored its biggest MLB audience June 14 when the Yankees-Tampa Bay Rays game averaged 980,000 viewers. On ESPN, “Sunday Night Baseball” is down 8 percent, averaging 1.61 million viewers. ESPN also thinks its second-half schedule is backloaded (i.e., it has more Red Sox-Yankees games scheduled) and expects ratings to rebound. HOW GO LOCAL RATINGS? The St. Louis Cardinals are in the midst of one of the most amazing streaks in baseball. Television ratings for the team’s games on FS Midwest have been among the three highest in MLB over 18 consecutive seasons (2000-17). Halfway through a 2018 season that has seen the Cardinals flirt with the .500 mark, the team once again is perched atop MLB’s local ratings and is on pace to stretch that string to 19 years. Cardinals games have averaged a 6.76 rating this year, placing the team just ahead of two other traditional MLB TV rating stalwarts, the Cleveland Indians (6.29 rating on SportsTime Ohio) and the Red Sox (6.19 rating on NESN). Overall, MLB’s local ratings through July 10 averaged a 2.98 rating, flat with last year. 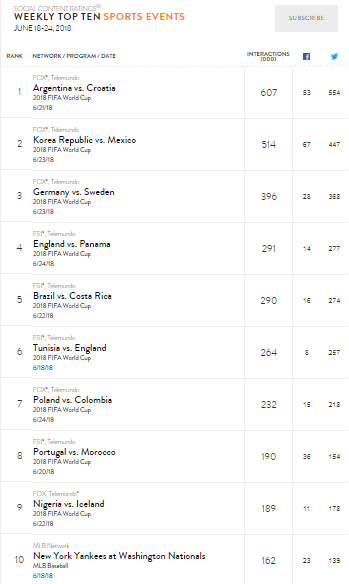 Of the 29 U.S.-based teams, 15 have posted increases and 14 have posted decreases. Those stories include Houston Astros games on AT&T Houston, which are on pace to deliver the team’s best ratings since 2007. They include Atlanta Braves games on FS South and FS Southeast, which are up 50 percent (to a 3.05 rating). And they include Yankees games on YES Network, which are up 11 percent to a 3.96 rating. At the bottom end of the ratings chart, A’s games on NBC Sports California (0.67 rating) and White Sox games on NBC Chicago (0.83) are the only teams that did not crack a 1 rating. Ratings for Baltimore Orioles games on MASN have dropped 50 percent, Tigers games on FS Detroit have dropped 44 percent, and Royals games on FS Kansas City have dropped 40 percent. Quite by accident, I stumbled upon a fascinating article about how the Tour de France is seeking to spice up its action in order to maintain its audience. Recommended reading for everyone who participates in the debate about evolution in the world of sports. CARCASSONNE, France (AP) — Tired of watching cycling races where nothing ever seems to happen? The Tour de France thinks it has some solutions to liven up the action: Shorter mountain stages, intermediate bonus sprints, and a Formula One-like grid start. "It's not really been done before so it's going to be tough..." says Geraint Thomas, the Team Sky rider wearing the yellow jersey. "I'm sure it will be good to watch, maybe not to race...."
I thought this was an interesting read and I hope you do to. I read another article on NBC sports that said NFL games are averaging 3% more viewers through the first 5 games this year over last year. However it is not enough to make for the losses sustained over the past couple of years but an increase is still an increase. NEWS FLASH... San Diego Chargers Los Angeles Chargers mull relocating to St. Louis?? Or maybe Oakland?? Just kidding, just kidding. I made that up. But seriously, I was gobsmacked to read at ESPN.com that "the viability of the Chargers in Los Angeles was a topic of discussion at the owners meetings" going on this week in New York. The San Diego Chargers reportedly paid $645 million in Jerry Jones blood money relocation fees to their NFL partners to move to Los Angeles last year. "The Chargers are currently playing in the StubHub Center in Carson, California. The venue seats about 30,000 people, which makes it about half as big as even the smallest NFL stadiums. Their plan is to move into the new stadium the Rams are building in Inglewood in 2020..."
Perhaps the NFL should have tried one team in LA before they relocated 2 teams? FLRacingFan and DUN24 like this. I don't know why Dean Spanos didn't take the money the NFL and San Diego offered and remain in the city. At the Stub Hub Center it is hard to know which is the home team as the visiting teams often get loud applause. Fortunately for the Chargers and the NFL there are any number of cities that would love to have them. Maybe they will end up in San Antonio, Portland, OK City or Memphis. The NFL makes blunders but they never over saturate the market. Those Supercross MEC numbers are unfortunate, especially given that last year's race was relegated to FS2 as well. The Los Angeles market as an untapped goldmine for the NFL is still theoretical and unproven. I doubt two teams will find enough support there. Meanwhile, it seems like the NFL is TV ratings resurgent this season, with more games showing increases than decreases. I've only watched about three or four games all year, but they seem to have stymied the losses of the past two seasons. As viewership for most entertainment programming continues to dwindle, the NFL is more dominant than ever. Very informative for those interested in the historical perspective. The heyday for overall viewership was the 70s through early 90s, the depths are in the late '00s and early' 10s, with a recent uptick. An expected bump from having two major sports markets and two historical franchises in the World Series is not happening. Probably sick and ******* tired of Boston winning sh!t. Although to be serious I think the games have been much longer so far. That's strange all excuses aside, so much of the stick n ball stuff is tilted or gerrymandered to the larger mo money urban areas. Always a fan of the Mulvihill figures. This 80% one in particular is just astounding. And ESPN’s demise has been greatly exaggerated. NBCSN ahead of FS1 is a little surprising - Olympics bump? pretty telling that over the air is way ahead and ESPN is available on lower tier plans. There is very little difference in homes subscribing to ESPN versus ESPN2, FS1, and NBCSN. Seriously, these are the numbers we were discussing just today in the other thread. The sharply higher viewer numbers for ESPN are due to other factors. The one not shown in the Mulvihill tweets is CBS Sports. If CBS keeps it, it will likely be looking to upgrade its sports properties. It lags way behind the others. MLB attendance has dropped to its lowest average in 15 years, down 6.6% from this time last year and 8.6% overall, according to Stats LLC. The league could see its first season since 2003 with average attendance below 30,000. While there are no statistics readily available on how much this drop is actually costing the league, a quick calculation — based on annual league-wide attendance rates, the 2,430 games played each season, and an average price of $76 per ticket — estimates a loss of nearly $355 million on ticket sales alone. This was in June, and attendance climbed back to only a 4% decline YOY after the final half. MLB cited a record number of April games played in sub-50 temperatures (102), as well as the largest number of postponed games since 1989 (54). That taken into account, 4% is probably not too bad. They still did reasonably well on TV, as MLB on RSNs dropped only 2%, ESPN -4%, FS1 -8%, FOX +9%, MLB Network +4%. And twelve teams had their RSN games rank as the #1 primetime program in their market. For the first time since 2014, the St. Louis Cardinals are perched atop MLB’s local TV ratings, thanks largely to the fact that the team stayed in playoff contention until the season’s final weekend. Cardinals games on FS Midwest averaged a 7.33 rating, a number that was up 2 percent from last year. Typically, teams that make the playoffs lead RSN ratings. That did not happen this season, as the Cardinals failed to reach the postseason yet still had the highest RSN ratings. At the opposite end, two of the five lowest-rated teams — the Los Angeles Dodgers and Oakland A’s — made the playoffs. The Dodgers’ numbers are negatively influenced by the fact that the team hasn’t secured full carriage in the L.A. market. Sports Business Journal reviewed data from 29 MLB teams for the entire season. Figures for the Toronto Blue Jays were not available. Overall, MLB RSN ratings dropped 2 percent, but the games still proved to be the most popular TV programming in most markets. 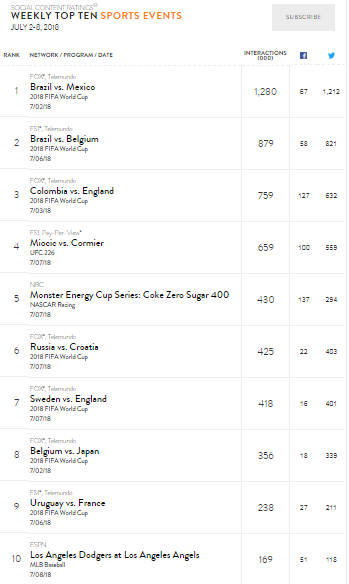 Games from 12 teams outrated all prime-time programming — including broadcast — in their markets; another eight teams saw their games finish in the top three for prime time. Nationally, Fox posted a five-year high with its MLB games, averaging 2.2 million viewers, up 9 percent. ESPN’s “Sunday Night Baseball” dropped 4 percent; FS1’s MLB games were down 8 percent; and MLB Network registered a 4 percent increase. Locally, the Red Sox’s TV performance mirrored the team’s record-setting on-field performance. During the season when it won a club-high 108 games, the team’s ratings on NESN posted a 24 percent increase. Its 6.83 rating is the second highest in MLB. In Cleveland, the Indians won the AL Central for the third consecutive year, but their ratings on SportsTime Ohio dropped 23 percent. Still, the team’s 6.43 rating is MLB’s third highest. One of the best stories is in Atlanta, where the Braves won the NL East for the first time since 2013. The team’s ratings on FS South and FS Southeast saw a dramatic 76 percent jump. At the other end of the list, the Baltimore Orioles saw their ratings on MASN tumble by 55 percent during a season when they lost a club-record 115 games. The Orioles’ 2.35 rating is the team’s lowest in at least 23 years, which is as far back as SBJ’s records go. Yeah much better, they estimate they only lost 93 million in ticket sales. Major League Baseball attendance dropped 4 percent this year, continuing a steady decline for “America’s Pastime.” It’s the lowest league-wide attendance since 2003 and the largest single-season drop in a decade. Poor attendance can also have a ripple effect on team revenue. Assuming each of those missing fans would have purchased two beers and a hot dog during the game, MLB teams lost another $47.2 million in food and beverage sales. That’s a conservative estimate, but MLB teams report attendance as tickets sold, not actual turnstile numbers. Other potential profits, like parking and merchandise sales, were also omitted in these calculations. I didn't say "much better", I said probably not too bad. I'm not quite sure what your hypothesis is either. If it's the usual "baseball is dying" that's been trotted out by mainstream media for well over a decade now, that's not the case. $93M over 30 teams isn't going to make or break the sport. gnomesayin and IanMcVittie like this. This is not a knock on NASCAR but just something that has occurred for many years. NASCAR or racing in general is not everyones cup of tea. Once they lose interest its hard to get it back. Specially when fans of NASCAR are far and in between. Boston’s comeback win, which peaked with 16.77 million viewers, was the least-watched Game 4 of the World Series since Royals-Giants in 2014 (10.74M). It topped only Royals-Giants as the least-watched Game 4 on record. Keep in mind that Game 4 did not begin airing on a Saturday night — the least-watched night of the week — until 2014. MLB seems to have some of the same issues as NASCAR including an aging fan base, periods of time where the perception is not much is happening and lower TV ratings. One thing where MLB differs is there is a possibility of a bounce back where in NASCAR the elevator only goes down. MLB is primarily now a regional sport, and there is high engagement at that level with the regional sports networks. While an average of 13 million viewers is not to be minimized, and was far and away the most popular thing the Fox network had to offer its viewers this fall outside of NFL football, these simply aren't the kind of numbers expected from a Boston vs. Los Angeles series. How this relates to NASCAR, which is a form of auto racing, is pretty pointless. Same with golf, tennis, the Olympics, you name it that isn't a franchise based league. MLB had around 70 million in attendance this year. IDK what NASCAR’s attendance will be for 2018 but I know it will be over 68 million less than MLB so comparing the 2 sports doesn’t make a whole lot of sense.